In my last post, I tried to answer the most frequently asked question about Fermented Food. Having done that, I am proceeding to the next one, i.e. 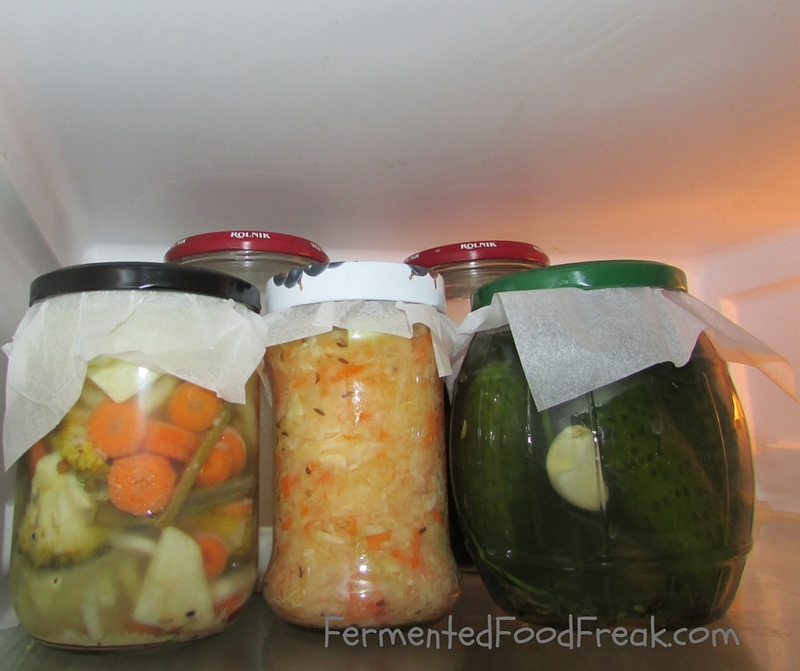 should Fermented Food be kept in the fridge? Sadly, the frequency people ask this question indicates that the Western world totally forgot the idea behind the invention of Fermented Food. Here it is: the reason behind the invention of Fermented Food was that people didn’t have fridges but had loads of cabbage and had to somehow preserve it for the whole Winter. They noticed that, when salted, cabbage turns into something edible that keeps for a long time. Therefore, the logical answer is: no, Fermented Food does not need to be refrigerated. However, it needs to be stored in a particular way, i.e. in a barrel or a stone pot and weighed down with a heavy object to make the veg constantly submerged in brine (or juice, if we talk about sauerkraut). It should be covered only with a cloth to keep the dust, insects, etc. away and to let the gases produced during the fermentation be released. The barrel or the pot must be kept in a cellar or other place with the relatively stable temperature around 8 – 12 °C. Vegetables kept in this conditions will constantly ferment and become sourer. The more sour they are, the more lacto-bacteria they contain. The more lacto-bacteria they contain, the healthier they are. However, this process will not run eternally. See my next post for the answer to the third most frequently asked question, i.e. how long will Fermented Food last? Going back to the refrigerating question. You can purchase a barrel or a crock with a bit of luck and determination, but where will you get A CELLAR in a place like Ireland? Therefore, my friends, you rather have to use the jar method. It is a lame, inferior method and unfortunately the one I am using for my ferments. Basically, you ferment in closed jars and at some stage move them to the fridge. Otherwise, you risk a jar explosion*. For the full description of how to make sauerkraut this way, read my post. Don’t get me wrong, the biggest gurus, like Sandor Katz, keep their veg in jars, but first they ferment them in barrels. See the video. I hope, this post made most of you satisfied. If you still have any questions, please, drop a comment below or on my Facebook page or email me at FermentedFoodFreak@gmail.com. If you live in Ireland, don’t forget to check the page with my Real Life Events. I would be delighted to meet you in person. Thank you for reading and enjoy fermenting! *The risk of a jar explosion is only theoretical, if you live in Ireland. Now, here is my very personal secret: at any given time I have a few jars with fermented veg in my fridge and the rest stays in a plastic box on my balcony. Some of them are as old as six months and it never happened that I would experience something close to an explosion (however, I got some serious leaks that made the balcony rather stinky). I use the jars from the fridge as samples on my events and as presents for friends and for my own salads, sandwiches and snacking. The ones from the balcony I use mostly for cooking sauerkraut soup and other cooked dishes. A jar explosion sounds awesome! It’s actually rather nasty and not awesome at all, especially for the person who has to clean up all the mess. Thanks for the comment! Yes, burping is a good method, however, I personally am not a big fan of it as it exposes the veg to oxygen. I rather use non-airtight lids to allow CO2 to push the oxygen out. But it doesn’t mean that I never burp jars. The problem here in Ireland is how to find cool darkness in an average modern house or apartament. To me, cool darkness is a cellar. Well, ideally, of course. :-). Where do you store your jars?